Skiing Rumble is following the footsteps of Alaskan skiing giants: Okonek, Stock, Thrasher, Brunton, Shlosar, to name a few. Its been skied by a variety of routes and lengths of time. Each based on a preference for slogging, comfort, or sheer brute strength. Last Friday, after getting a favorable report (thanks Scott and Peter), Alex, Andy, and I were ready to give it a go. As we've waited for a weather, stability, and schedule window, we've tossed around ideas of reasonable ways to ski Rumble. We settled on entering Peters Creek via the X Couloir, then egressing via Raina. With a low snow year we stayed in our running shoes until we were on the Falling Water rock glacier. Across the way were lots of good memories of linkups on Raina. The fat chute connects nicely with Mount Pleasant, the X, and, well, Rumble. Somehow I had forgotten just how aesthetic the X is. Perhaps the good memories was drowned out by our previous epic here. The top half of the couloir was fun skiing thru light wind affect, but near the confluence with the cross the snow deteriorated into breakable crust then ice. Both times I have skied the X its had bad snow while nearby lines have been awesome. Coincidence? Done with the chattering ice and refrozen debris, we looked up at 2,000 vertical feet of beautiful terrain. From the Peeking amphitheater we headed downhill towards Peters Creek. Along the way we passed under the infamous "Peeking King" as dubbed by Joe. Skiing this along with the X would make a fun day. Towards the valley floor spring was in full affect. This blueberry patch was actually remarkably slippery and rock free. I kind of regret not skiing it fall-line, but we had horizontal to cover. At the creek, the huge isolated mountain came into view in the middle of the valley. We refilled our water bottles, I tossed one of my climbing skins in the creek, and then we headed up the valley. With patchy and thin snow we had to walk thru the mild brush until gaining more elevation. In the amphitheater under Rumble we loaded our skis on our packs and transitioned to booting. The scale within the giant couloir was wild. Above us a choke barely wide enough for a pair of skis disappeared around a corner. But, we didn't seem to be getting closer to the choke, instead it seemed to be getting wider. Reaching the choke, it was 50 feet wide. Higher on the face, Bold came into view behind the shoulder of Benign. I think that's Skybuster in the distance. At the rock chimney we climbed one by one onto the summit snowfield. Nearing the top, the snow had been scoured away by recent winds - firm enough that to see the boy's side-step tracks from a couple weeks ago. On such a thin year the summit ridge was snow free and we scrambled thru loose choss to the top. Every new peak brings a slightly new angle on old views and brand new views of its own. Andy with Bellicose and its hanging glacier, The Shroud. What a line! If only it weren't quite so exposed. Yukla looming large and not particularly skiable. East and West Kiliak with Eagle Peak behind. 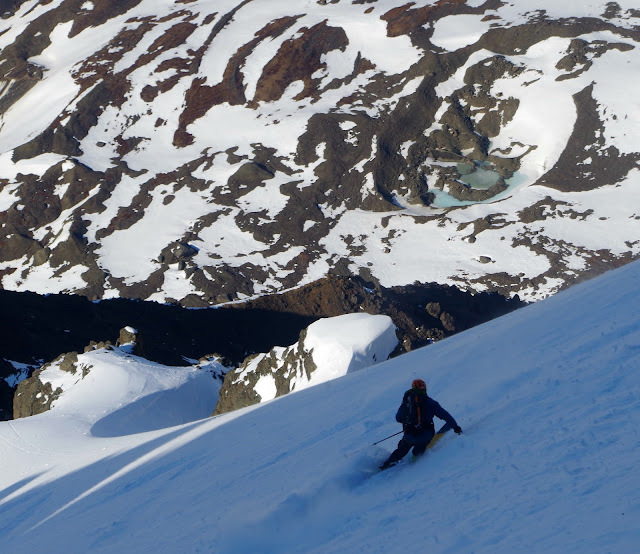 I think Kellie, Phil, and Shasta have skied one of the pinched coolies on West Kiliak. It sounds like it can go to the ridge too. East Kiliak will be a fun adventure ski. Wrapping around the dogleg we were back into the sun for the first time in awhile. By hugging the huge walls we avoided the crust from the sun and constant sloughing. The apron had the firmest snow, which was still enjoyable. Alex dwarfed by a sub peak of Rumble. Finished with the apron, we looked up at the face above us. Andy commented on how he hadn't looked closely at its size on the way up. I hadn't either - it was big. The derelict ice on the right is all that is left of the glacier in Rumble's amphitheater. Back under the Wall Street Glacier we refilled our water bottles in a spring and took one last look at the peak. At this point I put away my camera - it was 6:30 PM and we still had to go up and over Raina. First, we contoured around Rumble and into the south fork of Peters Creek. At the end of the valley Transcendence Peak was bathed in evening light. We could see a fun potential ski run off of East Kiliak complete with a hanging blob of ice. Once underneath Pleasant, we climbed towards the hanging valley. After skinning thru large patches of tundra, Alex reported long purple berry streaks in the snow. Above us was Pleasant's derelict glacier was glowing in the light. Before sunset we were on the final scree climb up to Raina. I had tried not to think about how punishing this part was going to be. But, the final gatekeeper was there, and it nearly got me. I bonked like I've never bonked before - stumbling upward thru the haze of the pain cave as Alex and Andy waited patiently in the cold wind above. Lesson: bring more than 2,000 calories for days with 14,000 vertical feet of climbing. At the top, the warm lights of Eagle River greeted us as we began our last descent towards the car. This is one I'm not gonna forget soon, seems like most days in Ram Valley end up being that way.